Earning a reputation as a highly-competitive venue on the Formula 1 circuit, the 2012 season's visit to the 5.451-kilometer Shanghai International Circuit for the third race of the year ushers in a strong opportunity for the finest open wheel entertainment. 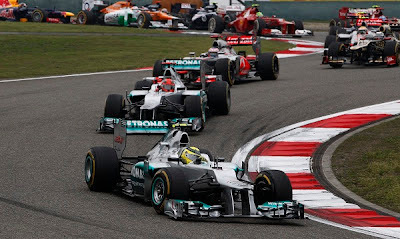 With two of the Formula 1 series hallmark teams going to victory in the first two races of 2012, the Chinese Grand Prix weekend was turned electric when the Mercedes GP team scored their first pole as a constructor since 1955. Nico Rosberg, the squad's younger driving ace, would be under a lot of pressure Sunday starting on his first-ever grand prix pole in Formula 1 in 110 races. Bringing comfort to Rosberg on the front row, teammate Michael Schumacher (who qualified 3rd fastest in qualifying on Saturday) was promoted to 2nd on the grid for the Chinese Grand Prix when McLaren's Lewis Hamilton is forced to serve a five grid position penalty after a gearbox change. The all-Mercedes GP front row at the 2012 Grand Prix of China led the 24 cars across the line on a dry Sunday afternoon. Launching from the standing start, Nico Rosberg stormed off the his grid position holding on to the lead while seven-time Formula 1 champion Michael Schumacher slotted behind his teammate with little challenge heading into turn 1. While the Mercedes GP cars enjoyed a picture perfect launch during the 2012 Chinese Grand Prix, the same could not be said for the third place-starting Sauber-Ferrari piloted by Kamui Kobayashi. Having a terrible start on the Shanghai International Circuit, the Japanese driver fall to 7th during the race's initial lap. Kamui Kobayashi's loss with a gain for the McLaren-Mercedes of Jenson Button who managed to position his race car in a 1-2-3 scenario for Mercedes-Benz power on the first lap of the Chinese Grand Prix. Last year, the Shanghai International Circuit served as a prime showcase of the Drag Reduction System (DRS) rear wing as a method of increasing competitive passing in Formula 1. 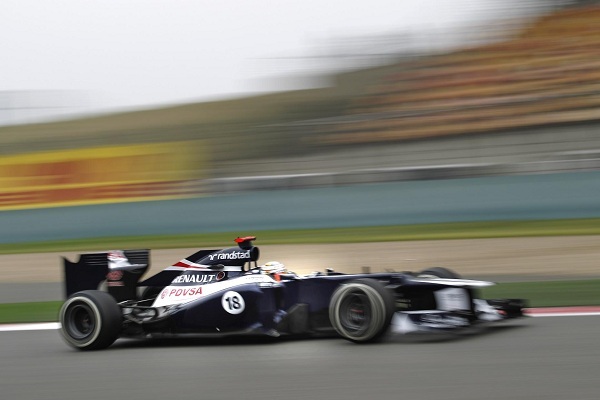 It took a while for the 2012 edition of the Grand Prix of China to revive the excitement of the 2011 event on track but there was indeed some great passing on track. In the past two races, Mercedes GP has gained objection in the paddock from other teams for the use of a ducting system that enhances the DRS that funnels air back to the front of the W03 race car. However, with Nico Rosberg at the front for much of the grand prix, there was little chance to use the uniquely designed aerodynamic device. As Rosberg led the Chinese Grand Prix comfortably over Lotus-Renault race cars at lap 29, A final round of pit stops took place for the race. When Jenson Button surrendered the race lead through lap 37, the McLaren-Mercedes driver was preparing for his final pit stop in his battle for a podium position. PItting on lap 40, Button suffered from a uncharacteristically long stop time lasting over 10 seconds. The McLaren team tire crew appeared to have struggled on the left rear corner of the race car as Button was released into 6th place on the racetrack. Through the final 16 laps, Jenson Button would work his way back to 2nd place in a very hotly-contested grouping for positions behind Rosberg. 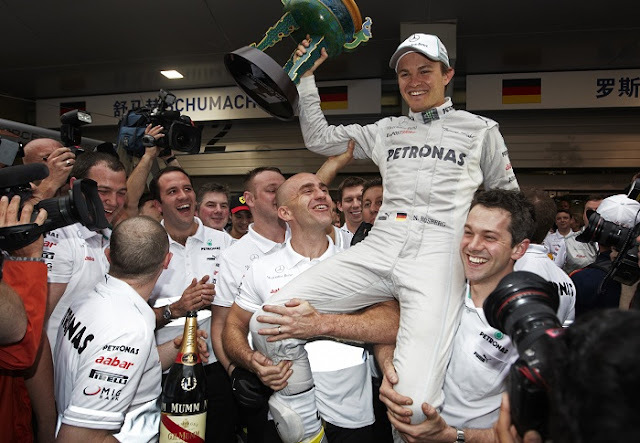 Driving a textbook, error-free grand prix for a winning driver, Nico Rosberg crossed the start-finish line first at the Shanghai International Circuit with the Mercedes GP W03 race car for a momentous victory. 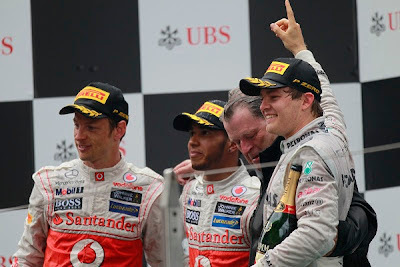 Finishing 20.6 seconds ahead of Jenson Button, the Rosberg delivered Mercedes GP an inaugural podium-topping performance in their third season after buying the Brawn GP team. Son of 1982 Formula 1 driving champion Keke Rosberg, Nico's first Formula 1 victory is a rare opportunity where two generations of one family have won grand prix races joining the Hill and Villeneuve name. With Jenson Button coming across the line in the runner-up position of the Chinese Grand Prix followed by his teammate Lewis Hamilton, McLaren has claimed podium finished in all three grand prix races held on the 2012 Formula 1 calender. 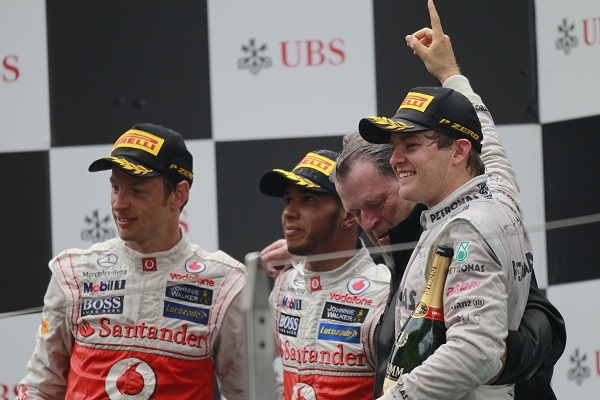 The McLaren cars placed 2nd and 3rd in the grand prix allowed Mercedes-Benz power to dominate the podium of the 2012 Grand Prix of China. In fourth and fifth place, the Red Bull Racing team cars of Mark Webber and Sebastian Vettel improved their grid position in qualifying but are still off from their performance benchmarks of the past two Formula 1 seasons. Passing Vettel on the final lap of the Chinese Grand Prix, Mark Webber is a beacon of light to the Red Bull-Renault RB8 this season as he finished 4th for the third straight race of 2012. After completing just a handful of grand prix laps in the two races starting 2012, Romain Grosjean survived the entire Chinese Grand Prix's 56 laps and brought his Lotus-Renault across the line in 6th place. "It was a very good race, I really enjoyed it. To be up there fighting with McLaren and Red Bull is a great feeling and I’m happy to have got my season started properly." said Romain Grosjean. Lotus F1 Racing teammate Kimi Raikkonen was also a factor through much of the Grand Prix of China but suffered late tire degradation issues that dropped the Finnish driver out of a points-scoring position at the checkered flag. A full team achievement for Williams F1, both drivers Bruno Senna and Pastor Maldonado collected points finishing securely in the top-10. 2012 Chinese Grand Prix winner Nico Rosberg made his Formula 1 debut with the Frank Williams racing outlet in 2006 and drove four seasons for the team ahead of his current tenure at Mercedes GP. Topping the podium at the Malaysian Grand Prix a several weeks before, Ferrari and Fernando Alonso faced a harsher race in China. Alonso captured 9th on the Shanghai International Circuit finishing a second and a half ahead of Kamui Kobayashi. A series where Lewis Hamilton is clinging to the top of the 2012 Formula 1 driver's championship tally with only 2 points over teammate Jenson Button after three races, the next grand prix is scheduled for the Bahrain International Circuit. The Grand Prix of Bahrain is set even under a cloud of uncertainty for whether the event will actually take place due to political and civil tensions in the country.